You are currently browsing the tag archive for the ‘zombies’ tag. The blood, shouts, gun shots, raw fear and frantic chaos of violent nihilistic death took me back nearly 50 years. At age twelve I was stunned by The Night of the Living Dead which deeply changed subsequent cinema, literature, and culture. Last night I relived moments of the iconic film at Wait for the Blackout, a one-act drama where the conventions of undead culture played out in the flesh (which did not always remain attached to the human form). 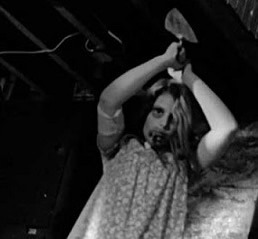 George Romero’s classic depiction of desperate people in a farm house resisting hordes of the zombies smashed numerous social boundaries including parricide, infanticide, cannibalism, racism, and reverence for the dead. 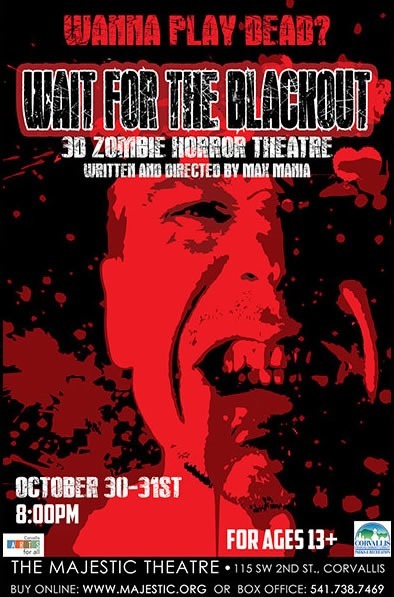 Max Mania’s stage depiction of desperate people in a theater surrounded by undead referenced many of the ideas which have become the staples of zombie cinema. A successful aspect of Wait for the Blackout is the use of unseen elements that establishes the enveloping threat. The back stage plays a prominent role as events unseen erupt in the alley as well as the lobby and street in front. Disturbing noises from all round rendered the impending threat very real. What was outside – whatever it was – would soon be coming inside and that would not be good. The characters in Wait for the Blackout are the strongest aspect of the play. They are the stage crew for a work in production; all of them flawed personalities. The effect of this work comes largely from stripping away of the characters social compensations for their flaws as the horror of the moment leaves only their raw vulnerability. Dora’s cynical facade is corroded by the cascading violence. Rachel’s stoic optimism falters as she encounters situations that she cannot understand or adapt. Daniel makes an interesting transformation from selfish cowardice to resolute stoicism as hope drains. Alex, the clueless Director, undergoes a more ambiguous change as he loses humanity entirely to ultimately betray his cast. Wait for the Blackout’s players explore these psycho-dramatic subtleties convincingly. Most of the action was played for laughs and received as such. The humor came from over-the-top effects, references to clichés of the zombie genre and characterizations such as Daniel’s exasperating cowardice. The film Zombieland used similar devices. Unlike that film, Wait for the Blackout is punctuated by the abjectly unfunny such as how to treat the corpse of a friend. Wait for the Blackout’s script had difficulty reconciling the role of the audience. On one hand the action all takes place in an empty theater as the stag crew works on set design. Yet as the plot ensues the actors directly address and involve audience as if engaged in a live show – which it actually is but not written as. Since the players also address the violence that is happening outside the theater, the alternation of speaking forth from the stage is unclear. In the play the lights fail over time until the power of darkness overtakes every spark of hope. Redemption is lost and those in attendance have become witness only to the doomed and the dammed. That’s impressively fresh dramatic effect for a genre that has been worked to death.